It is December 21, 1963. The Beatles continue to hold the #1 chart position with "I Want to Hold Your Hand." Doctor Who continues apace with another claustrophobic episode featuring the four main characters and nothing else. The show is still feeling its way around, uncertain of what it is. But as with the first episode, it is already clear that it is something. Most notably with Ian's line describing the Doctor as having "a knack for getting himself in trouble," a character trait that will sustain 48 years and counting of stories. But in other ways, the show seems lost, following the trends of futuristic design laid out by classic movies like Forbidden Planet instead of breaking new ground. The dead world of Skaro is a monument to retro-futurism. The TARDIS is not yet a magical box, with excessive effort being made to actually explain how the thing works. The fact that the change of the Doctor and Susan to aliens instead of futuristic humans was a last-second production decision is still clear, with both acting as though the TARDIS is just future technology that any species would acquire given time. And on top of that, the Doctor is still openly cruel. When his companions - including Susan - beg to leave the planet, he betrays them all, deliberately breaking the TARDIS so that they have to go to the futuristic city and explore. Here we have our first inkling of why the Doctor does what he does - his burning need to explore and see new things. But it is not yet wedded to any sense of kindness. He is not a hero. Not yet. The show also presents its first aliens. Initially they find a metal creature in the forest, and the Doctor chastises Ian for failing to adequately imagine how much the universe can differ from his experience. Then, in the episode's iconic cliffhanger, Barbara, at this point a character mostly used so that everyone else has someone to rescue, is menaced by an unseen monster with a bizarre arm. And for the third time in a month, everything changes. Five days later, "I Want to Hold Your Hand" is released in the US, changing the Beatles from the most popular band in England to the most popular band in history, sparking so-called Beatlemania, which will itself inspire the name of the eventual Dalekmania. Two days after that, the Daleks are named. But what, exactly, are they? For the second episode, at least, this is held in check. They are devious, and we are certainly not inclined to trust them, but they do not seem the malevolent evil that we will someday know them to be. The Doctor is not a help here - he does not recognize them, and they do not recognize him. This is their true first meeting, and it is a wary one in which each of them tries to feel out and understand the other. The Daleks seem to warn of a greater threat, the hideously mutated Thals living out in the wilderness. Meanwhile, the show takes a turn to the crushingly bleak, with the characters slowly dying of radiation poisoning. The Doctor manages to negotiate for Susan to be allowed to go get the anti-radiation drugs needed to save them. 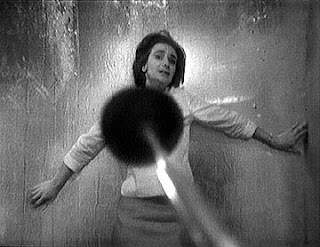 At the end of the second episode, the Doctor lies near death, and his companions, who by now know he sabotaged the TARDIS, seem to want to keep him alive only because they need him to fly the ship to get them home. It is not until the start of the third episode that we begin to see the Daleks as monsters, though that is accomplished in a scene that is, in hindsight, deeply uncomfortable. Susan, emerging from the TARDIS, encounters a Thal. The camera holds on Susan as she reacts to it, finally saying that she had expected the Thals to be disfigured, but that "You're perfect." With that, the camera cuts to a strapping blonde Adonis of a Thal, indicating the definition of perfection. The degree to which this definition is Aryan is all the more chilling given that Carole Anne Ford, who plays Susan, is Jewish. But underneath the flagrant racialism is the beginning of a vital point about Doctor Who - the fact that the show is, at heart, anthrophilic. That is, it loves humans. The Doctor is in the end more human than alien. "Good" species are the ones that look human. The other species of the universe are, by and large, monsters. And after the next episode, we see exactly what this means. For the first time, the Daleks begin talking of extermination, and gun down the Thal leader for no reason other than because they want to kill him. This is where the Daleks become monsters, and Doctor Who acquires one of its fundamental dualisms: people and monsters. But here in the early days of 1964, there are still racial troubles in the UK, even if they are overshadowed by the horrific racism in the US. Indeed, the darker side of racism in the UK is its invisibility, and its close links with the supposedly proud colonial history of the country. At this point, Doctor Who treats racism in a manner that can only be called uncomfortable. It will be a long time, if ever, before any serious case can be made that this has changed. Indeed, the show quickly hedges against any claims that it might be liberal by painting the Thals as deluded fools for their pacifism. The end result of this is that there becomes a strange irreducibility to the terrible evil of the Daleks. It is not merely their xenophobia. This becomes clear over on their end of the plot, as they come to realize that the massive radiation levels on Skaro are now necessary to sustain Dalek life (in a bizarrely psychedelic scene) and decide to irradiate the planet and exterminate the Thals. What is interesting at this point is that the Daleks are not wrong. Contrary to the Doctor's insistence that the two races could live in peace, one of them needs radiation to live, and the other needs a lack of radiation to live. It is an unstable, primal state, and the Doctor actively chooses to let the Thals live and the Daleks die. In the end, the closest thing to a moral difference that can be drawn is that the Thals, perhaps naively, would never try to exterminate the Daleks for their own survival. In fact, it is the Doctor that orchestrates this, planning to drain the Daleks of the static electricity they need to survive. (A quirk of Dalek physiology that will be ignored rom this point on, fitting in mostly with the obsession with trying to make the show scientifically plausible that will soon be abandoned) When this finally comes about, the Doctor says, cruelly, that he does not want to save the Daleks, and anyway, that he can't. There is a moral distinction here that is not yet fully formed. The Daleks are monsters because they recognize nothing that isn't Dalek. This, in the end, is why the Doctor hates them. Because he is, in the end, interested in the vast strangeness of the universe, in seeing and learning everything. It is not that the Daleks are willing to kill to survive. It is that they don't care. The Thals, whatever their flaws, do care. Standing in the wreckage, the Thal leader mourns that there should have been another way - a refrain that the Doctor will someday echo in sorrow. But he has much more to learn about being the Doctor between now and then. As this story ends, the Doctor, with obvious glee, provides the Thals with guidance on how to start a new civilization. He declines to stay - he is too old to be a pioneer, though once, he says, he was. But his love of creating a situation like this is obvious. It is the first time since Ian and Barbara intruded on his life that he appears happy. Here, for the first time, he is truly learning to be the Doctor. But to learn to be the Doctor, he needed a monster. And those monsters have also learned this episode. Much of them is already in place - the Dalek design is sufficiently iconic to be almost wholly unchanged until the controversial 2010 redesign. Other parts of them need to be set - although they love exterminating, they have not yet learned the fundamental joy of shouting "Exterminate" a lot. They have also not learned that they really want to avoid lengthy dialogue scenes. But they have learned that they have an enemy. That there is a man with a magic box who will always show up, and will not let their callous destructiveness stand. In hindsight, the Doctor's late revelation to them of the existence of the TARDIS is one of the great throwings of the gauntlet in history, the commencement of a 48 year struggle with no end. Before long, both sides will meet again. And this time, the Daleks will, not for the last time, extract a terrible price from the Doctor. Do you own The Daleks on DVD yet? If not, consider buying it from Amazon via this link. I'll get some of the money if you do. Susan is warned to beware of the Thals because they are horrifically deformed by radiation. Not because they are African or Slavic in appearance. So, how can one read a racial context into her surprised remark “but you’re perfect”. She’s saying that the Thals are perfect because they’re not hideously deformed, not because they have blond hair and (presumably) blue eyes. I wonder if this ties in with what you say about the differing history of racial friction in the US and UK. Maybe the post-60s culture of the US tends to have a default assumption of racial tension unless proved otherwise. That’s not nearly so much the case in the UK and certainly wasn’t in the 60s. That’s not to say that the racial tension wasn’t there. You go on to say that DW treats racism in “a manner that can only be called uncomfortable.” Really? The baddies in this story are clearly the Daleks. There’s no attempt at even-handedness in painting them as having and understandable point of view. And the Daleks are defined as hating those who are different, specifically racially different. So these murderous, would-be genocidal baddies are defined by their racism. How is that an uncomfortable treatment of racism? As for pacifism, it’s a perfectly valid argument to say that pacifism in the face of aggressive racism is profoundly illiberal and that fighting against it is the genuinely liberal approach. The problem is that the camera is telling its own story here - the cut to the chiseled Adonis of a Thal as Susan speaks of his perfection - not his normality, but his perfection - is a racial commentary. There's no way around it, for me. Is it an intentional one? Well, perhaps not, but it's a flagrant one. I'd also point out that the Daleks-as-Racist-Nazis idea post-dates this story. These Daleks don't hate the Thals for being different. They just hate the Thals because they're a threat to Dalek survival. But the larger comment about the show's uncomfortable treatment of race is meant to apply to the Hartnell era at large - in particular stories like Marco Polo, The Aztecs, The Ark, and The Celestial Toymaker, and to the extreme whiteness of 1960s Doctor Who in general. "I'd also point out that the Daleks-as-Racist-Nazis idea post-dates this story. These Daleks don't hate the Thals for being different. They just hate the Thals because they're a threat to Dalek survival." I disagree. When Alydon asks why the Daleks hate them Ian answers: "A dislike for the unlike. ... They're afraid of you because you're different from them." And the clipped voices and heiling eyestalks seem like a direct development of standard cinematic portrayals of Nazis. I don't know why my ID came out like that! Apart from the blond hair, what specifically marks the Thals as 'Aryan'? Yes, there's an uncomfortable association of 'physical perfection = moral perfection' at work. The Thals are good and know to be good because they are handsome and beautiful and strong, and the Daleks evil because they are deformed and ugly and so weak they need to encase themselves in metal just to move around. And they have blond hair because that's what's traditionally considered attractive. It's what gentlemen prefer, after all. I guess you could claim that that is itself a racist ideal, but that still puts the racism at one remove from 'Doctor who' -- being guilty of adopting unquestioningly a possibly-racist standard of beauty is very different to being guilty of even inadvertently putting in an actually racist message. I can't help thinking that if this story were to be made today, the production team would have included black Thals -- tall, muscled, handsome black Thals -- and that this would have been exactly the same as the original, with the same dubious message of 'handsome = good'. In short, with regards to this story (and only this story: in the wider context of the Hartnell era you may be right, I haven't got there yet) you seem to be hanging a very serious charge on the very flimsy evidence of a few strands of blond wig. John Kenneth Muir, author of "A Critical History of 'Doctor Who' On Television," believes that the blond hair and blue eyes of the Thals is a much more plausible link to the Eloi from Wells' "The Time Machine" than anything to do with Aryanism. Also, there's the line from "Dr. Who and the Daleks," which was a little more ornate in the TV version: "If they call *us* monsters...what must they be like?" This is secondarily true of Troughton, but with a big asterisk we'll get to later, and actually may not be true of Hartnell, but we're years away from getting to that bizarre retcon. You throw in this kind of foreshadowing a lot. It would be nice if you could throw in a link here and there, now it's all written, so those of us not in the know could find out what you were alluding to. The Daleks in this story are high-tech(for 1963, at least) versions of the mad hermits Vincent Price played in the Corman Poe films. At one point they were intelligent, sophisticated noble figures who made one fatally catastrophic decision at a moment of crisis that has led to their current confined fearful state, and that fearful state it what makes them currently dangerous monsters. The Daleks are as neurotic as Roderick Usher in their first serial. It's a;sp worth mentioning that, at this point on children's TV in Britain, we had no prior murderous, scary alien monsters of any description. The nearest were robots on puppet series liKe FIREBALL XL5 or SPACE PATROL. But they were interacting with puppet humans - not live actors - and never as homicidal as the Daleks. Little wonder they caused such a stir. You cannot judge this serial in anything other than contemporary attitudes. Their impact on child viewers had a visceral punch at the time. Speaking of which, will you be doing the shows of Gerry Anderson in HOME IN TIME FOR TEA. Their influence on Dr Who - eg the scientific bases and jargon of the Troughton serials - cannot be underestimated.